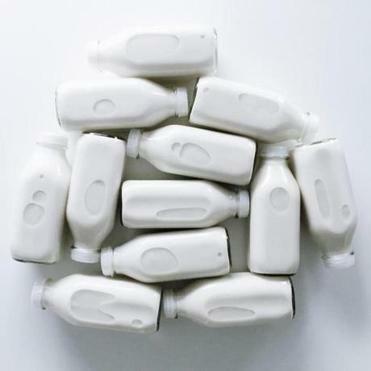 Every Tuesday, Nectar & Green drops off classic glass bottles of milk at the homes of 150 subscribers. But in a very 2016 twist, it’s almond milk — organic and handmade. The milk is pressed on Mondays, so this is as fresh as it gets. “We’re like the milkman — the reinvented milkman,” says Laurel McConville, a resident of the South End, of her small-batch milk-delivery service. McConville, 35, began making almond milk in 2010. At first it was just for herself, but by June 2015 she had left a job in progressive education and launched Nectar & Green. A year later, McConville’s team of six works out of a production kitchen on the North Shore. Nectar & Green is a subscription service. Starting at $28 for two quarts per week, they’ll deliver anywhere in Boston or Cambridge. Smaller orders can be picked up at partnered locations. Nectar & Green’s recipes are simple. Their most basic milk contains nothing but almonds and water. The sea salt and honey flavor is the same, with the addition of salt from Gloucester and honey from Ipswich. Other flavors are similarly refined and grown-up: vanilla bean, matcha, lavender, and cacao. Its pared-down approach is exactly why Nectar & Green’s milks are available by delivery only, not on shelves at Whole Foods. Without preservatives or pasteurization, the milk is good for only a week, unlike store-bought nut milks that can last on shelves for months. But that’s the beauty of it, according to McConville — whose goal is to grow Nectar & Green’s delivery model, not to get into display cases at high-end grocery stores. Nectar & Green’s almond milk is $14 per quart. Orders of two quarts or more can be delivered to any location in Boston or Cambridge. Subscriptions result in a delivery every Tuesday and can be canceled or paused at any time. Smaller orders can be picked up at the Urban Grape (South End), www.theurbangrape.com; Tatte Bakery & Cafe (Charles Street and Third Street locations), www.tattebakery.com; FoMu (Jamaica Plain), www.fomuicecream.com; and Mayflour (North Shore),www.mayflourconfections.com. To order online or for more information, go to www.nectarandgreen.com. Bettina Makalintal can be reached at bettinamakalintal@gmail.com.